Halloween 2016 is right around that next spooky, dimly lit corner and you can have your best Halloween costume ever with Monster Makeup FX! 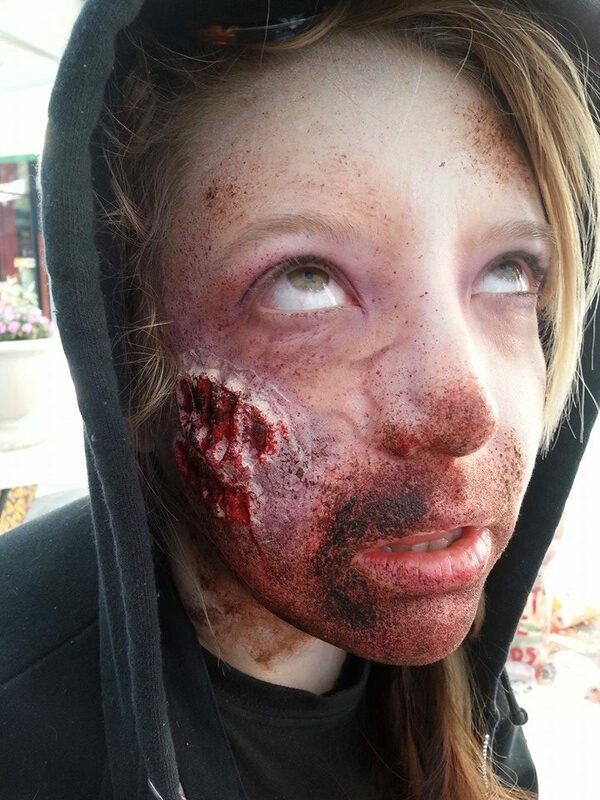 Our team can do custom costumes and complete special effects makeup looks including special effects prosthetics (and application), custom props, wardrobe, and more! And gore! We also do "day of" makeups by appointment in popular categories like zombies, and skull and sugar-skull painted makeups for Halloween and Dia de los Muertos. Contact Monster Makeup FX today to make your appointment and so we can get started on your best Halloween costume ever! Significant Lead Time May Be Required. Contact Us Today! "About to turn". Also known as "the minimalist zombie". Paled-out, zombie veining just starting to show. Minimal blood. Bring-your-own wardrobe & accessories. 2 zombie facial prosthetics, enhanced zombie pallor and zombie veins, blood splatter from your last kill. Bring-your-own basic zombie wardrobe and we'll do some light weathering & distressing effects. This one's been dead for a while. Includes multiple zombie facial prosthetics and at least 1 arm or body prosthetic. Sunken, hollow appearance and covered in blood and filth from all the roaming and mauling. Bring-your-own wardrobe and we'll zombify it appropriately. If you saw this zombie, you'd wonder what was holding it together. Includes multiple facial, limb, and/or body prosthetics plus, is that optional pus? GROSS! Extremely desiccated and decayed appearance. Covered in filth and blood from all the killin'. 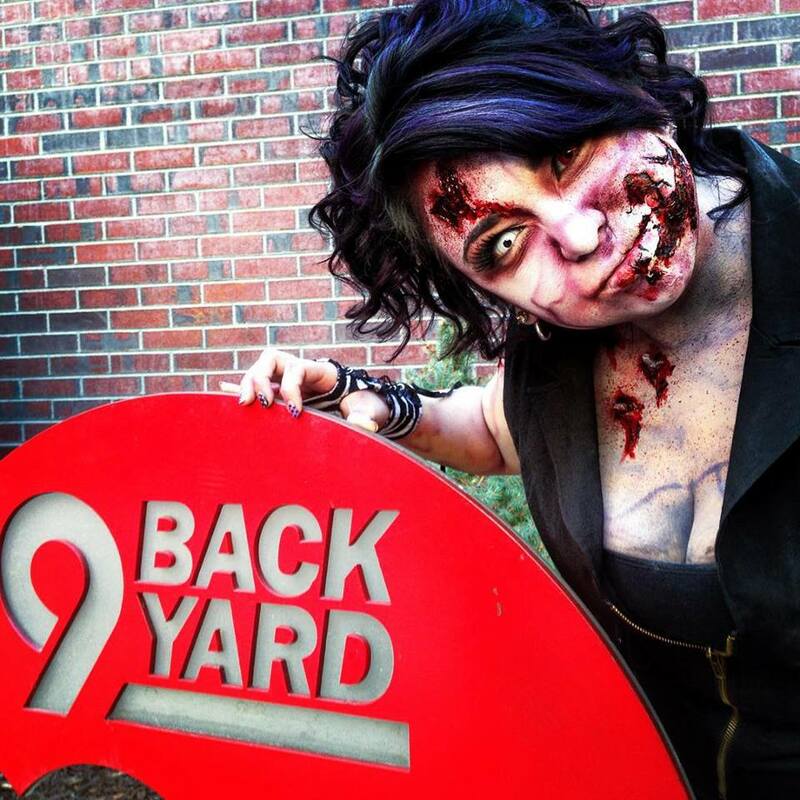 Bring-your-own zombie wardrobe and we'll reduce it to filthy rags for you. The wrinkles and the grey hair is starting to show...but not too bad. We'll add about 10 years to your face. Bring-your-own wardrobe & accessories. You'll look just like you, just old. We'll add about 20 years to your face and hands, along with significant wrinkles and grey hair. We'll even make sure you're sprouting some extra ear-hair, just for good measure. Free Liver Spots! Bring-your-own wardrobe & accessories. We'll add as many years as we can to you. Wrinkles and grey hair galore. Multiple prosthetics and aging techniques will combine to make you look like someone who's ready for dinner at 4pm. You'll look so old you'll start to feel old! We'll add at least 25 years to your exposed skin, face, and hands, along with even more intense wrinkles and grey hair. You'll have all the extra ear-hair and crazy eyebrows that you can handle! Male or Female "Old-person" wardrobe included. ADVANCE NOTICE REQUIRED. CONTACT US TODAY. An easy-to-wear Halloween classic skull makeup done by one of our seasoned team of artists. Price increases based on level of detail desired. An embellished painted skull makeup perfect for celebrating Halloween or Dia de los Muertos. Easy to wear and unique. Price increases based on level of detail desired. You tell us what you want, we apply it. Contact us today. Lead-Time Required.